Smiling for the camera with medals in hand. On the 19th of May, Raffles Basketball played an electrifying match, against long-time powerhouse Hwa Chong Institution. In spite of their intimidating streak of having won the Championship title for the past 9 years, Raffles Institution’s team did well in their pivotal match, wresting the A Division title for the first time in nine years. From the start of the game, Raffles set up a stable ten-point lead. 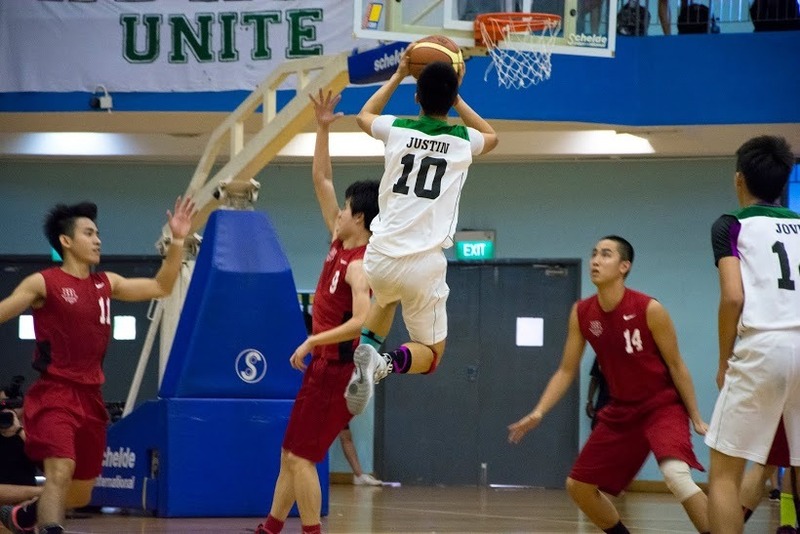 Most Valued Player Justin Yeo (#10) stood out for his clevers moves which outwitted the Hwa Chong defenders throughout the game. While the whole team displayed excellent chemistry, another standout player of the game was Vignesh Rengarajan (#11), who helped to score many goals using his quick reflexes and nifty footwork. Justin (#10) shooting into the hoop for the team. Similarly, Hwa Chong’s team lineup featured many capable players, so both teams were matched evenly in terms of skill and physical ability. Despite this, Raffles pushed on to take advantage of Hwa Chong’s minor slips in ball handling in the midst of their intense match, and tapped on several free throws, to add significantly to the scoreline. At one point of the game, the difference in scores even went up to 20, in favour of Raffles. The game reached its climax in the last quarter, with Raffles putting in their utmost to retain their lead from the third quarter, and Hwa Chong trying desperately to close the gap. It was a frantic last lap, with both teams’ coaches repeatedly calling for timeouts to give the players pep talks and motivate them in the last few minutes of the game. Unfortunately, the large scoreline gap between the teams proved too big for Hwa Chong to close, thus ending the game with a 17-point victory to Raffles. 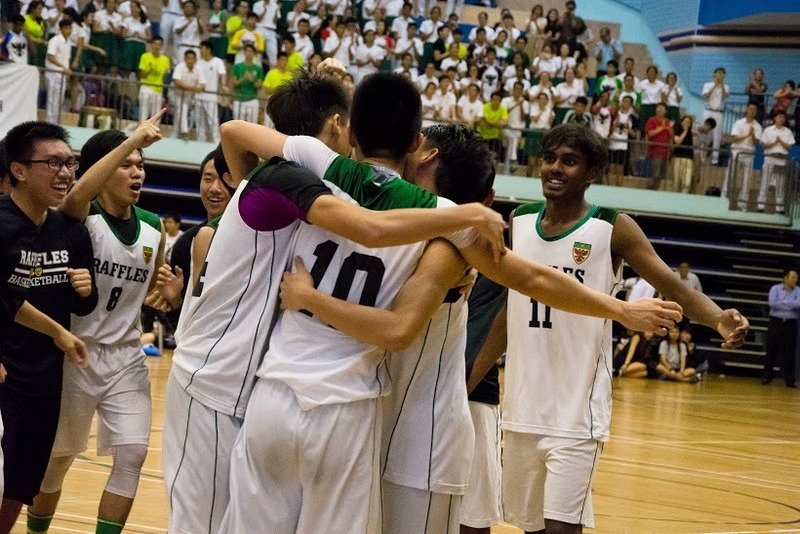 The team spirit of the Raffles basketballers was evident in a poignant moment at the conclusion of the game, when the other players spontaneously ran onto the court for one big, comforting group hug. The team in a moment of friendship and camaraderie. When asked about his thoughts on the team’s performance, the Boys’ Coach Mr. Liu Tong immediately replied that they had done “very well”. With 8 years of experience in training Raffles Basketball under his belt, he commented that this year’s team was particularly “capable” and “well-behaved”, and could rise to champions as long as they had the necessary team spirit. The importance of team spirit was echoed by Ejin Tan (#9) (16S03S), who mentioned that the most impressive part of their victory had been their teamwork, as they did their best to sync the ball and create open chances to score. Ejin shared that the team had put substantial effort into their game preparations; committing to physically-demanding trainings thrice a week, as well as having serious talks about their game strategy. It was undeniably not an easy journey for our players, but they managed to rise above the occasion to do the school proud despite the tough competition. 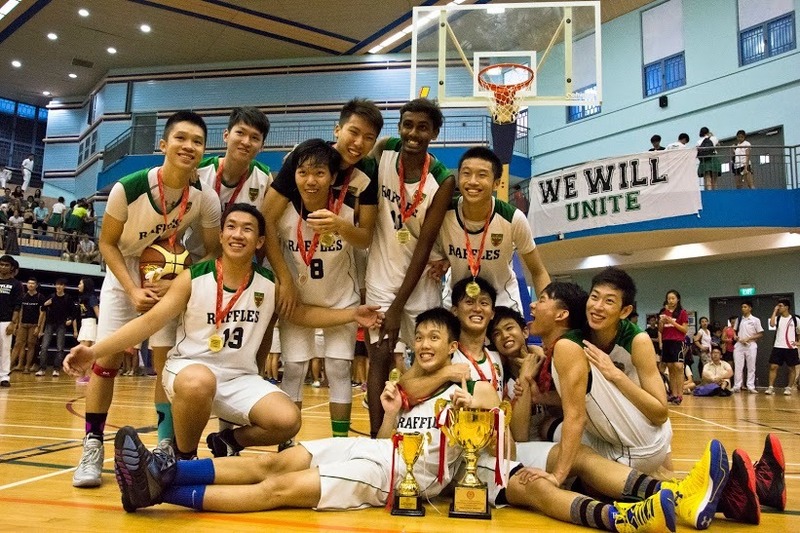 Raffles Press would like to congratulate the Basketball Boys for their hard-won victory!